It makes me feel amazing whenever I bring in some really good brand, resource or information for you all. Okay before we go any further let me ask you a very simple question. Why do men from the 60s always looked so dapper and well put together? The answer is because their accessory game was on point. They used to pay special attention to accessories that could make any outfit Flat to Fab. The amazing HATS, SUSPENDERS, BOW TIES, whatever we see today as a statement piece was an essential century those days. So , I’ve teamed up with Trendhim to talk you through some ways you can incorporate some old school charm into your wardrobe through your accessories. Some may consider suspenders to be the ultimate ‘Grandpa’ accessory but they are actually a stylish and classic accessory, especially for a formal occasion such as a wedding. They were first worn in 18th century France as an, at the time, essential alternative to a belt but their use has change over time and they have become a fashion accessory. Whilst others rely on boring belts to hold their trousers up, why not bring in some old school cool and go for a pair of suspenders? Aside from being suave, they are also comfortable to wear due to the elastic and they are long-lasting. If you’re not brave enough to go for a pair of patterned suspenders, then simply go for a block colour. This colour should contrast the colour of your shirt,for example go for red, burgundy, navy or black pair if you’re wearing a white shirt. Red and burgundy also look particular good if you’re wearing a light blue shirt. Suspenders feature either clips or buttons to attach them to your trousers.Many trousers still have buttons available on the inside for this exact purpose so incorporating suspenders into your look shouldn’t be too hard. If your trousers are lacking buttons, then you can go really old school and sew some in yourself. Bow ties emerged at the beginning of the 19th century as a development of cravat ties and they rapidly gained popularity amongst gentlemen. They were originally reserved for formal occasions and were mostly worn by the wealthy but they were quickly adopted as a fashion accessory. No matter whether you’re attending a wedding or simply hanging out with friends, a bow tie is an appropriate accessory. There are bow ties available in a huge range of colours, materials and patterns so regardless of your personal style, you are sure to find on you like. If you are wearing a black suit with a white shirt, then you might want to go for a colourful or patterned bow tie. Another way to look stylishly incorporate one is to match it with your suspenders. Combining the two will give you a truly old school cool look. Don’t be put off by having to master the art of tying a bow tie as there are clip-on and pre-tied ones widely available. Out of every accessory we’ve talked about here, lapel pins are the most ancient – they were pioneered in Egypt around 1800 BC! 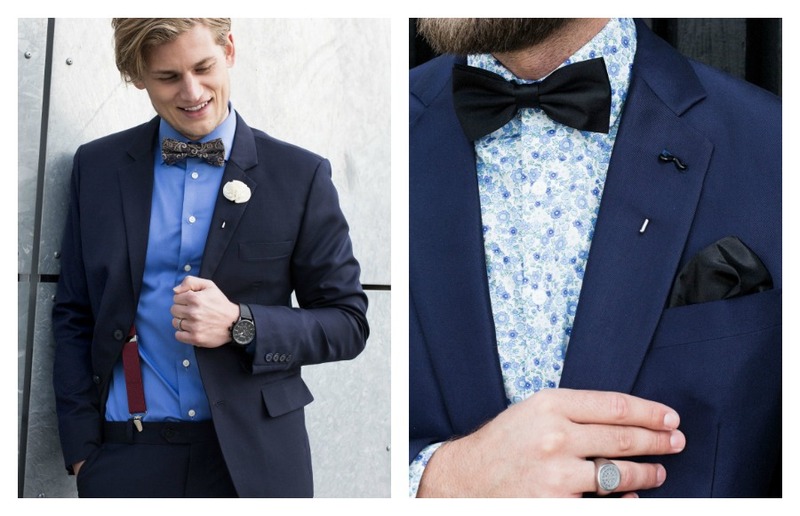 Lapel pins, also known as boutonnieres, were also once reserved for formal occasions like weddings and prom, but they are now a suitable addition to most outfits. No matter what kind of pin you go for, they should always be worn on your left. Lapel pins are available in a variety of styles, from flowers to simple metal designs. If you’re unsure what colour to choose, then consider matching it to other accessories you’re wearing or find another complimentary colour. The size of the pin is completely up to you and dependent on what you’re comfortable with. A good rule to follow is that if the pin is the only accessory you’re wearing then you can get away with wearing something a little larger.